My nail tech, Jennifer, was a quiet and gentle soul. As business slowed down, we found ourselves the only two in the shop for a moment; I asked her if she had ever had any health issues from working in the nail business. She shared that when she worked at a salon that provided acrylic nail services, her throat would hurt very badly and her eyes would sting. She said she also had stomach problems from the chemicals at times. I told her about an article I read about many manicurists experiencing miscarriages or having babies with extreme developmental disabilities, likely linked to the chemicals they are exposed to every day while working. She acknowledged hearing that other nail workers had similar health issues. It made me sad to think that the treatments millions of women receive every day in order to look and feel more beautiful could be poisoning the professionals that serve them, as well as intermittently exposing themselves to unwanted toxins. It begs the question: What is real beauty and what price are we willing to pay for it—even at someone else’s expense? I love fast dry spray…but what’s in here, anyways? Was I any better for going to the salon myself? I caught a glimpse of the lotion bottle as Jennifer massaged my tight palms. 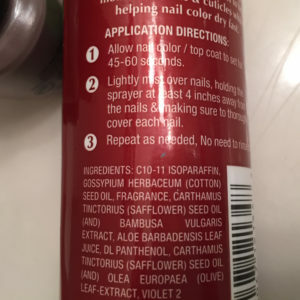 Parabens, tetrasodium EDTA and propylene glycol were just a few of the ingredients I could see from the side of bottle. 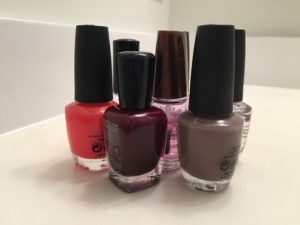 Granted I wasn’t getting acrylic nails or even gels, but the bright blue foot bath pellet, the acetone applied post-lotion to ensure the polish held to my nails and the magical drying drop; what were the effects of all of these chemicals? I certainly don’t suggest we live in a bubble or never treat ourselves to a little pampering. I just have to believe that we can have it both. We can have health and beauty, without compromising one for the other. At least that is my hope, and the reason why I’m making PRETTY UGLY. I want to find some real answers to the chemical safety of personal products and share my discoveries. I’m believing for good news, and I hope you are too!